This weekend I came across Prez Jordan's post on Julia sets, I then followed the trail back to his original post on the Mandelbrot set. I've always loved fractals, since I read Gleick's Chaos back in school, and I used to spend hours generating Mandelbrot images on my Amiga when I should have been learning CS at University. I did at one point try to write my own Mandelbrot generator, but quickly got bogged down in trying to manage enough code to get a basic UI in Workbench and gave up and went to the pub. The canvas element provides scripts with a resolution-dependent bitmap canvas, which can be used for rendering graphs, game graphics, or other visual images on the fly. 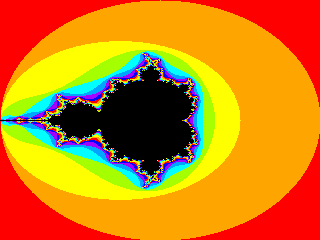 The function returns a different colour based on how many iterations it takes for z to exceed 2 in magnitude when combined with the input value c in the formula z * z + c (if it doesn't exceed 2, then it is in the Mandelbrot set, and so it's black). The input value is the pixel position on our canvas element except translated into a complex number - where the x axis is the real component and the y axis the imaginary one - ctx.fillStyle = mandel(c);. Check the Wikipedia page for full details of how the Mandelbrot set works, I worked out most of the details through trial and error once I had it functional. 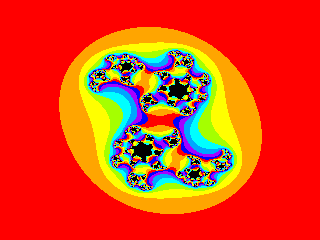 You can take a look at the final Canvas Mandelbrot/Julia Generator here. In performance terms, doing a calculation to render each individual pixel is a pathologically bad case for canvas - it's not something you'd normally do, you would make use of the higher level drawing controls instead. As it stands it does make an interesting performance comparator between browsers. I tested it in Firefox 3.6 (about 2 seconds to generate each image on my machine), Google Chrome 5 beta (about 1 second for each image) and Opera 10.50 (about half a second for each image), it ought to work in Safari too but I didn't try it. I did a version which used Explorer Canvas to try and see how long IE took, but it kept hitting the script timeout before it was even one third of the way through. I wrote one too, it seems to be a bit faster, you can see it here. Thanks Kevin. Yours does seem quite neat, allowing you to zoom in and out.